A high standard cloth for general purpose wiping. Extra tough and suitable for light industrial tasks, wiping away fine oil and grease. Packed in a mobile box with pop-up dispensing. 200 wipers per box. 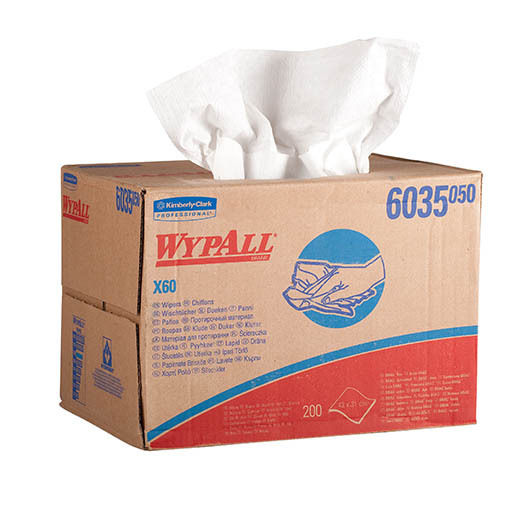 The Wypall* X60 is a versatile and durable cloth designed for light-duty cleanup of adhesive, oil, debris; applying lubricants, thinners, solvents; cleaning glass; precision cleaning of intricate machinery and parts; cleaning hands. Each cloth is reusable, durable and perfect for wiping hands, precision cleaning of intricate machinery and even glass. This product is packaged in the BRAG* box mobile system, giving you immediate access to hygienically protected wipers on the move. Unique HYDROKNIT* technology ensures that each cloth is strong enough to withstand multiple surface types, and still be absorbent enough for the greasiest, oiliest and heaviest spills. The X in X60 stands for eXtended life; each cloth is rinseable and reusable enabling you to use fewer cloths reducing your costs. No wonder the WYPALL* X60 range is the cloth of choice for industry professionals who demand the very highest standards of hygiene and cleanliness. This product is sold as 1 box x 200 white cloths (200 total).